The weather has been so changeable recently, one day the sun is shining and I am out in the gardening - sowing seeds, transplanting plants into the ground, building climbing frames for my legumes, the next its pouring with rain and I'm reaching out for my hot water bottle (yes, sometimes I can be a real wimp!). And guess what, today its been drizzling. The last couple of times when its been wet and windy, I've come home and made Risotto, first Smoked Paprika with white PSB and and then Fennel and Black Olive Risotto. It could have easily been another Risotto with the last Jerusalem Artichokes of the season, but I've made Jerusalem Artichoke and Parsley Risotto in the past and wanted to try something different, but it still had to be rice. So I opted for a Pilau/Pilav style rice dish. I know its not the most well presented dish, just dished up on the plate - but this is how real homely food is served and today, I am not in the mood for faffing about, as well as the fact that the natural lighting is just not conducive for food photography. 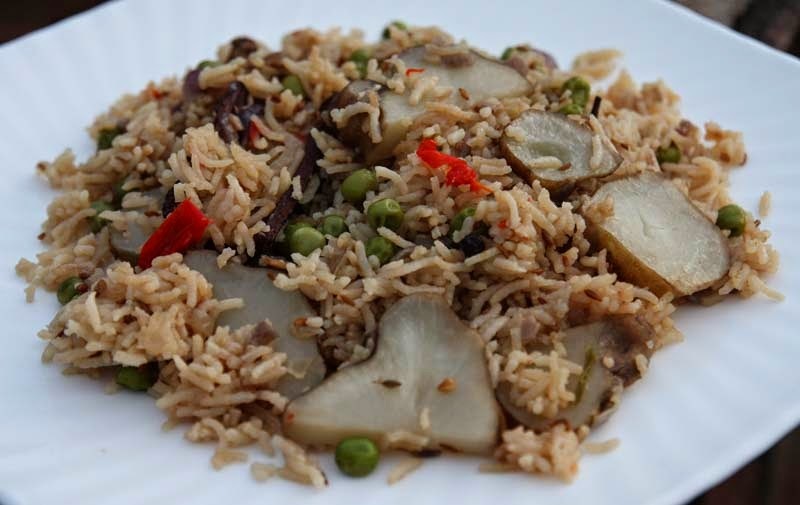 This savoury rice dish is my take on a Pilau rice dish that my mother would make, I have just changed the ingredients in it. I must say, my mother would just *throw in all the whole spices into the pot to infuse the rice. It was quite normal for us to be pushing the cassia bark, cinnamon sticks to the side of the plate; or picking out the cloves and peppercorns, so the appearance of these inedible whole spices don’t bother me. However, I understand not everyone is like me and may find them unsightly, even off putting. So with the exception of the coriander and cumin seeds, you may wish to tie the spices in a muslin cloth whilst cooking and then remove it when serving up. Heat oil in a pan with a tight fitting lid. Add the onion and all the spices, red chillies and cook until the the onion is meltingly soft. Stir in the rice, dry fry for a couple of minutes, before pouring in the water. Bring to the boil, then stir in the chopped artichokes and peas if using. Turn the heat to medium and put the lid on and cook on low heat for 25 – 30 minutes. Stir rice well before serving. Go on Joanne, make the mushroom risotto - its still raining here. I know, this weather is driving me insane!... 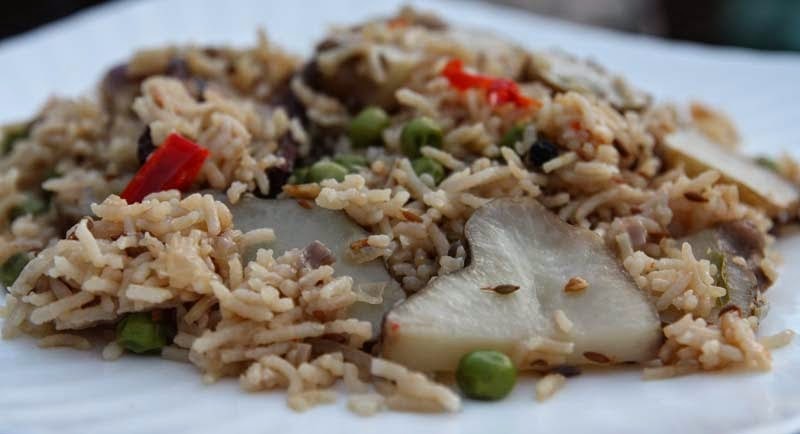 gorgeous rice salad though... haven't had jerusalem artichoke served this way for years! Thanks Dom, always lovely to hear from you.